Many of the users started out with VS Online before there was a clear view of how the future of TFservice (as it was called previously) would like like. Because of that, some people may want to take this transition to GA as an opportunity to reconsider their ALM configuration and move to an on-premises TFS server. Therefore, Microsoft enabled a data export window for any customer that has been on the service and wants to “opt out”. 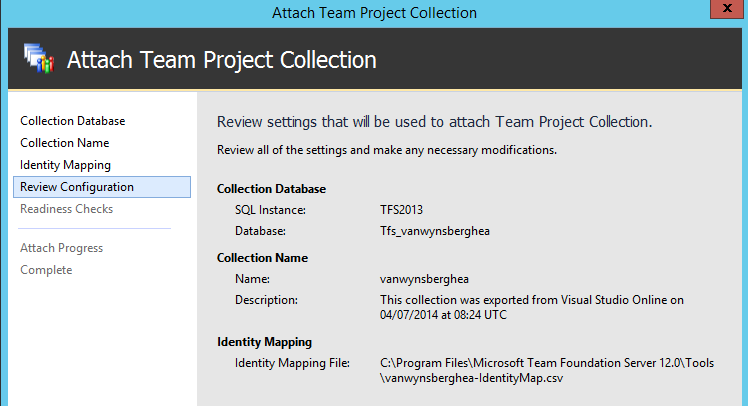 You now have the option to export your data from Visual Studio Online in a format that can be imported to Team Foundation Server 2013 Update 2. The data export process is a transfer of a faithful reproduction of your Visual Studio Online data. Next step, click on start, and you will get a “warning”, stating that VSO get more frequent updates than a TFS on-prem installation. Click “continue“. Your export will be queued and after a minute or 10, you’ll get the option to download the export. As you can see, the .zip file only contains 3 files. A readme file, a settings.ini file and user mapping CSV. The .zip file does not actually contain the data from your online project, but does contain the information used to download the data during the import process. This will download your VSO database (which is actually stored on an Azure Blob storage) and restore it to your SQL instance. 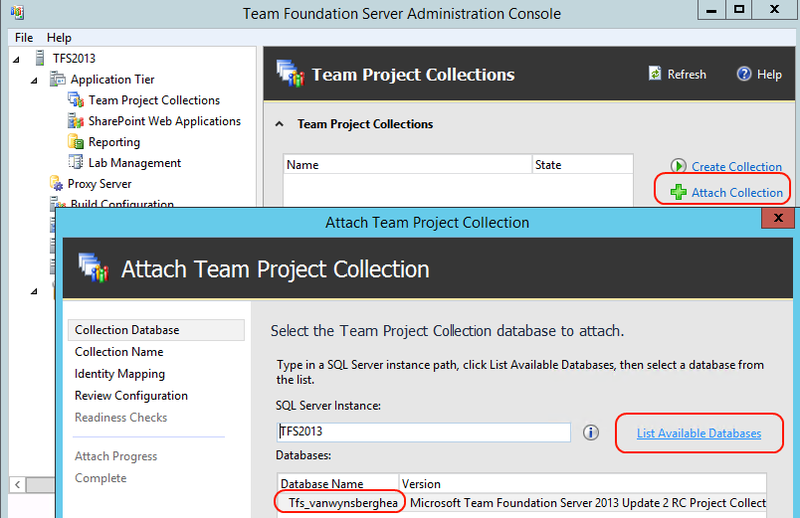 The default name of this new database will be “TFS_vsoaccountname“. In my case: “TFS_Vanwynsberghea”. If you want to change this behavior, just edit the settings.ini file. (oh, and do not share that file, as it contains a Shared Access Signature Token used to give read access to your data’s storage container on Azure). On the Identity Mapping page, browse to the .csv file you modified with the user association information and open it. Your users should appear in the list, including the association information. Review it to make sure that the details are correct and complete the wizard. 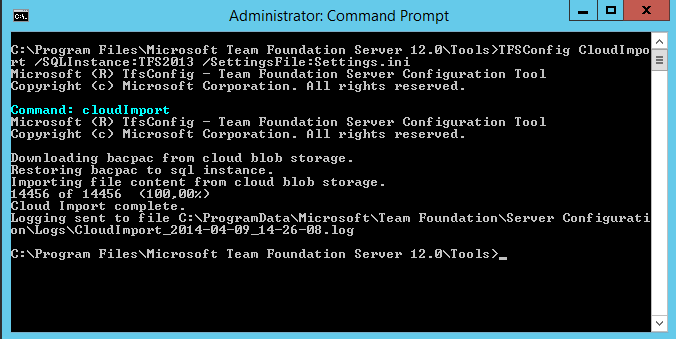 That’s it, you now have your VSO data on your on-prem TFS instance. That was a smooth process! Kudos to the Visual Studio Team! Is this something that Microsoft only intend on making available for the time window to May 7 or is this a feature that they will keep so that people can make the switch at a later stage if they discover that they need to do something that isn’t offered in the online product like changing the process templates. I’m not sure, as for now, it will be available until may 7th.. 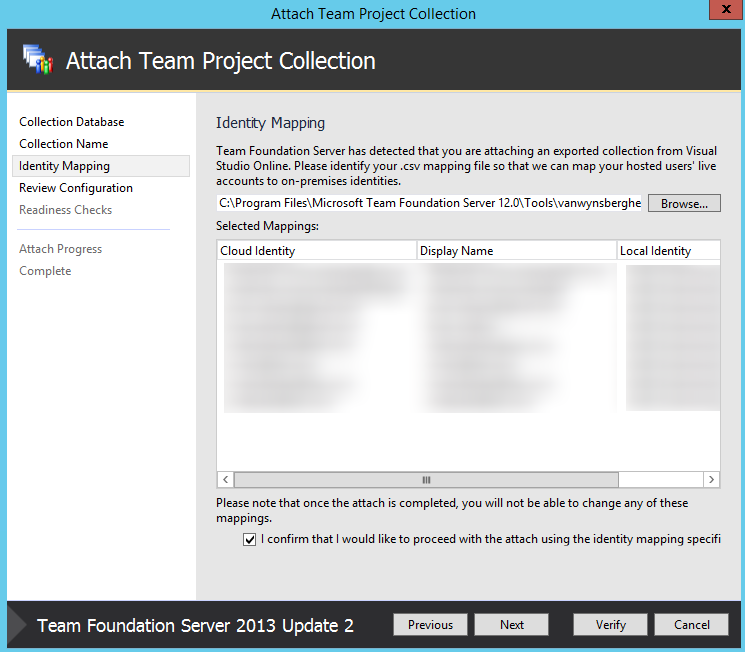 But I assume that they will make it “global” (meaning: no email to ‘enable’ the feature) in a more automated way..
HI Alex, I need to Migrate from TFS Online to TFS 2013 Update 2 On Premise. Just wanted to check whether this is still valid after May 7 also? Hi, as far as I know, it’s not available anymore. It’s not even listed on MSDN anymore..